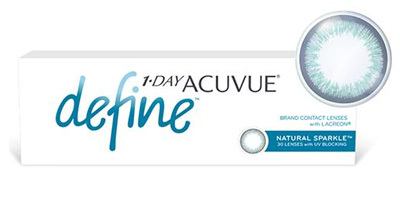 "Acuvue Define contact lenses have now been discontinued by the manufactuer." 1 Day Acuvue Define contact lenses in 30 packs are the latest lenses by Johnson and Johnson designed to enhance the natural beauty of your eyes as well as add definition and brightness to make them sparkle and shine. 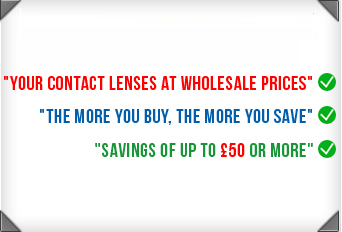 This is a daily disposable lens that comes in boxes of 30 lenses to give you the health benefits of having a fresh new lens in your eye every day. This lens is available in two design patterns; Natural Sparkle and Natural Shimmer. Natural sparkle is designed to give the wearer a luminous brightening effect. 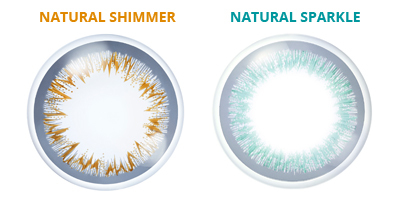 Natural Shimmer is designed to give the wearer a greater depth and more intense effect to your own eye colour. Both types of lenses feature a solid limbal ring on the outer edge to make your eyes look bigger and brighter and allow the iris to look natural and defined. So if you are looking to accentuate the radiance in your eyes this innovative new lens will help brighten up your eyes to create a look as unique as you.